These breeding lines are at various stages in development, but represent those that we voted as best of 2014. Since these plants were in four different breeding nurseries, MN, NC, PA and CA – there are at least two from each to avoid biasing by growing location. The fact they were not side-by-side, head-to-head, and were tasted at various times from mid-July to mid-August should preclude a formal ranking – but what the heck. #1 I planted Everett's Rusty Oxheart tomato a few years ago, and it was too late for our Minnesota season - never ripened. I was able to use it as a pollen parent in a cross, and wow! 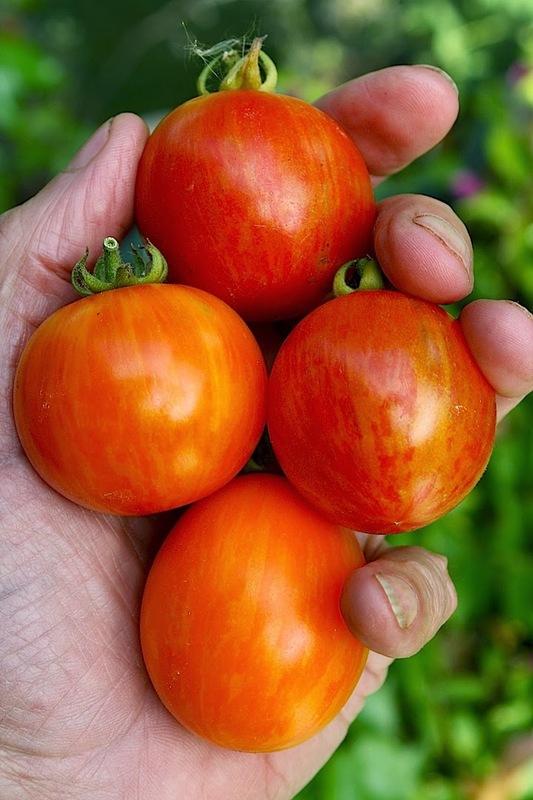 We've got a handful of F4 lines now that are hands down the best/tastiest tomatoes in our breeding nurseries. I’ve posted two photos that represent the range of about eight lines we are advancing. All have phenomenal flavor and a light to dark ochre skin with some pronounced green in the flesh. The fruit have heart shaped tendencies. Good lookers to be sure, but the flavor will make these famous. I have never been so optimistic about a breeding line. 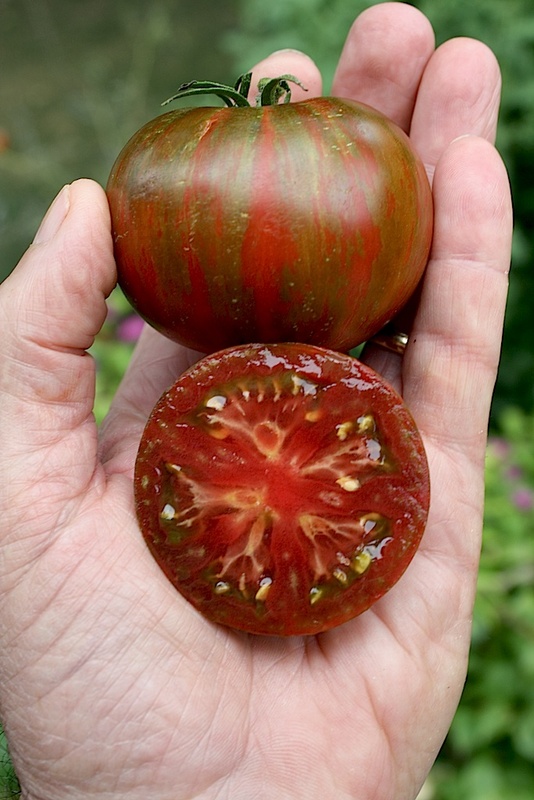 #2 I love the contrast between dark red flesh and the metallic green striped epidermis in this line. This trait combo is now fixed in the F5 – we are fine tuning now for flavor, fruit shape/size and plant health. We think this line will be outstanding. The two photos represent the surprise/thrill in cutting open the fruit. Someone online said it looks like a watermelon – perhaps. #3 Backcrossing is traditionally used to introduce a “donor trait” from a non-recurrent parent into a elite (recurrent) parent. BCx generation represents x number of backcrosses to the recurrent parent – for example (AxB) x B = BC1. A modified backcross means that the “recurrent” parent may vary from one generation to the next; (AxB) x C = MBC1, with A being the trait donor. Here are fruit from three excellent F4 plants from MBC2 lines with OSU Blue as the donor parent. Flavor in these striped indigo cherry/grapes is very good to excellent - basic trait package is fixed, fine tuning should be completed by 2016. #4 This is perhaps the best beefsteak I have ever tasted. Deep red with gold stripes, a F6 from Earl’s Faux x BTD. Unfortunately the only photo shows cross sections of F5 plants sliced open for tasting in the NC breeding nursery. #5 This F5 line has wow flavor and very interesting GWR tricolor flesh. Green w/ orange stripes saladette. 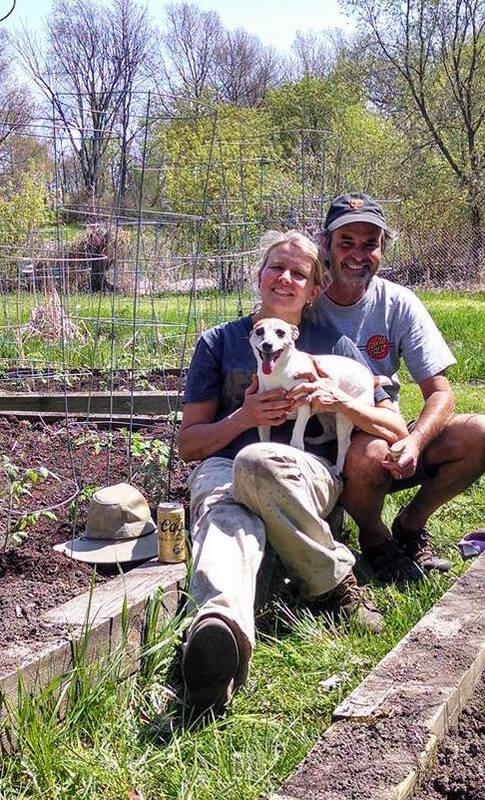 It placed first in two FLF tastings at our MN farm this year. It is still segregating some for fruit size, but flavor and tricolor flesh have stabilized. At our home nursery (MN), this is the one I headed to consistently this summer when picking a tomato or three for dinner. #6 We have a half dozen F6 lines from a cross between Randy Gardner’s GOB14 (LB/EB tolerant plum, similar to Plum Regal) and SunSugar. These lines combine the flavor of SunSugar with the plant health/fruit quality of GOB14. Shape varies from grape to elongated pear - this one was a favorite. Several of these were also at the MN nursery this year and rivaled #5 for most often eaten with/for lunch or dinner. #7 A great line in it’s own right, this is turning out to be a phenomenal parent. This F6 line traces to (Sungold x Pink Boar), with Brix >10, and a lot of flavor complexity. It is a poor seed producer with only moderate fruit yield - but tends to pass on most of its flavor attributes as a parent in F1 crosses. We call it the ugly duckling – but the taste will knock your socks off. #8 This started out as a project to combine freckles and Aft/atv fruit. The goal was gold freckles on an indigo background - and we are getting close. Still a work in progress, but this year at our NC/Burton Farms nursery we found this single plant in a row of 50. A friend suggested the name “Lucy in the Sky”. This year we’ll see if the phenotype is stable. #9 Best tasting GWR in 2014, this F4 has a complex pedigree with contributions from SunGold, BTD and Cherokee Purple. A striped oblong heart with very high yield, excellent fruit quality and very good plant health. We have high hopes for this line, though it is still segregating. #10 We love a starburst pattern on the blossom end, and have several such lines. This is one of the most striking, and best tasting. 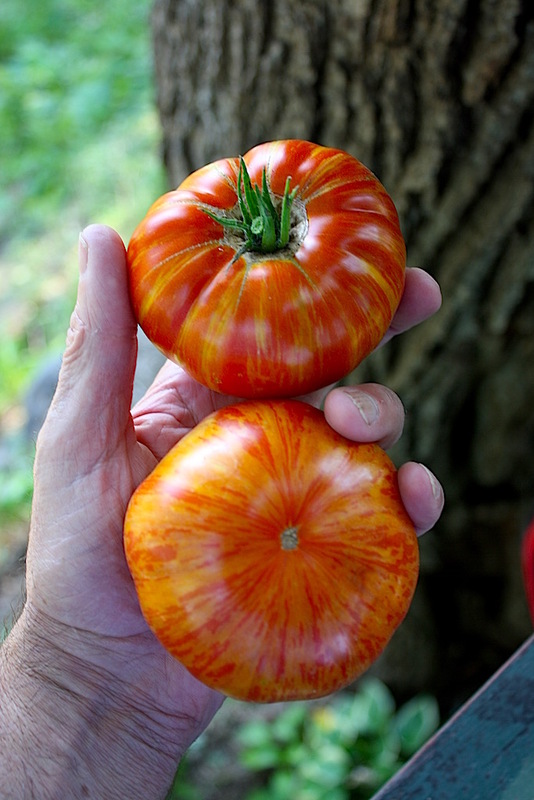 There are multiple genes that can affect fruit color in tomatoes. Although the major genes have individual effects, it is often the interaction between these major genes that produces the fruit color phenotype. What we see as fruit color is a combination of pigmentation in three separate tissue types; the epidermis, a sub-epidermal layer, and the fruit pericarp (flesh). The genes listed below describe most of the known major genes controlling fruit color, and the various alleles of those genes with their associated phenotypes. A few uncommonly found genes/alleles are omitted to try and simplify an already complicated matrix of gene interactions determining the fruit color phenotype. Most of this information is from a thorough literature review on this topic, and combined with some personal experience and observation when appropriate. In this document the wild type allele (responsible for the typical phenotype in cultivated tomatoes) is noted as + and mutant alleles at a locus are noted by the allele abbreviation (see TGRC list of accepted allele abbreviations), either in lower case (if the allele is recessive to the wild type), or upper case (if the allele is dominant to the wild type). Thus +/+ denotes that the plant is homozygous for the wild type allele at a particular locus (gene) and exhibits the wild type phenotype; t/t notes the plant is homozygous for the recessive “t” allele at the tangerine locus and has the tangerine phenotype; and Del/+ notes the plant is heterozygous for the dominant Del allele at the delta-carotene locus and has the Del phenotype. The “-“ character denotes that all alleles have an equal effect on phenotype, for example at the tangerine locus +/- means either +/+ or +/t, since either will result in the wild type phenotype. In tomato fruit the epidermis is a single layer of cells designed to protect the fruit from desiccation and mechanical injury. In the wild type tomato the epidermis is yellow (Y allele). This coloration is due to the flavonoid pigment naringenin chalcone which is embedded in the cuticle. It is thought that this pigmentation protects against UV radiation and may provide some protection against pathogens. The biosynthetic pathway for naringenin chalcone is controlled by a myb12 transcription factor. The recessive y allele is due to a loss of function mutation in this myb12 gene, resulting in a clear cuticle without significant naringenin chalcone pigmentation. The myb12 loss of function associated with the y allele also results in a cuticle that is thinner, lower in cutin content, and with less elasticity (see photo and graphs below). Myb12 also has broad effects on flavonoid and carotenoid pathways beyond the cuticle and the y allele is associated with generally lower levels of these compounds in the fruit (reference). 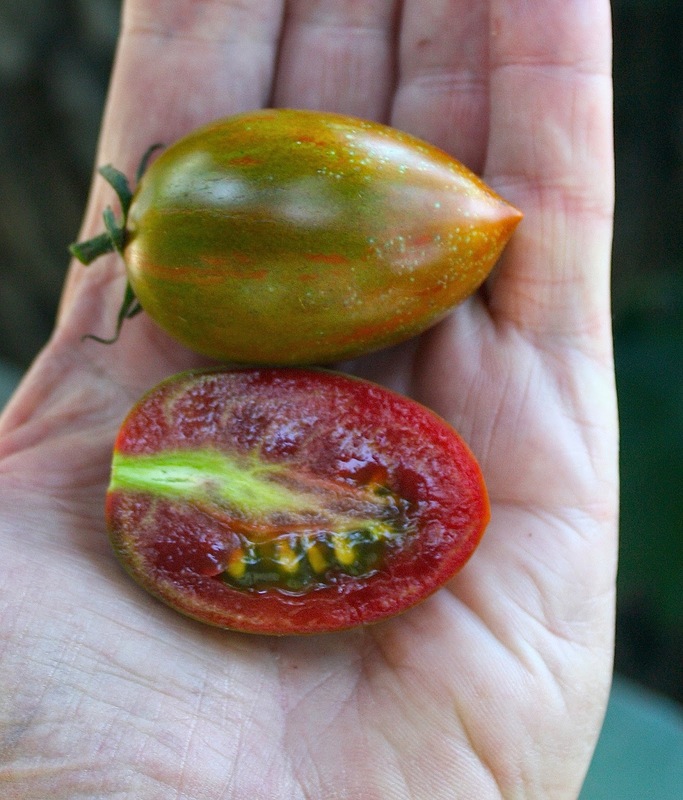 In the presence of the genes Aft and atv, anthocyanin pigment is accumulated in a few layers of cells in the fruit epidermis and sub-epidermis (see Breeding the Blue Tomato). Both genes were introgressed from wild relatives and are up-regulated by direct exposure to UV light. There is considerable variation in intensity of pigmentation among Aft/Aft atv/atv plants, strongly suggesting an epistatic effect from one or more unknown modifier genes. We have found there can also be sub-epidermal accumulation of carotenoid pigments. As a result, the color of the “skin” may be very different than the color of the flesh. We have developed several lines with red or reddish orange pigmentation of the sub-epidermis with yellow or green flesh (see photos). There is no previous report of this phenomenon in the literature. This trait is heritable and appears to be controlled by a single recessive gene. Last year we identified plants with a green sub-epidermis and red flesh. 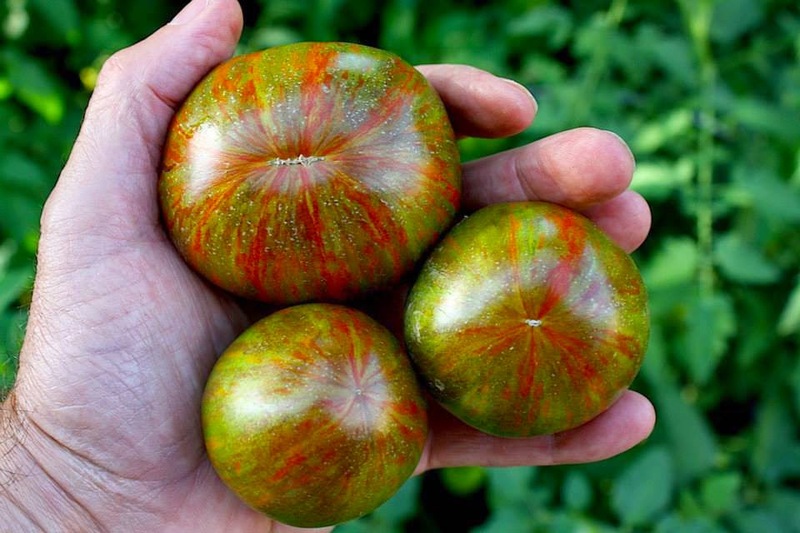 Although there appears to be considerable potential to modify “skin color” independent of flesh color in tomatoes, there is much to be learned. 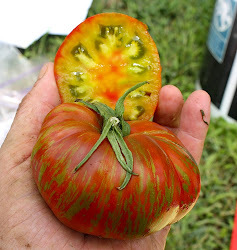 Fruit stripes are dark longitudinal stripes that develop on ripening tomato fruit in the sub-epidermis. In the literature this trait is described as being controlled by a dominant “Fs” allele. Our experience is that the trait is very sensitive to environment, not consistently expressed, and that dominance appears to be incomplete. Fs/Fs in combination with gs/gs can give some very interesting striping patterns (e.g. Beauty Queen), and Fs/Fs in a Aft/Aft – atv/atv background has shown a very striking tiger-like striping (see Siberian/Bengal Tiger blog). Freckles are another possible feature of the epidermis that can significantly alter fruit phenotype. A detailed discussion on what is known about the genetic control of freckles can be found here, but there is little reported in the literature and still a lot is not well understood. One interesting manifestation of this trait is in combination with the anthocyanin fruit phenotype, with gold/yellow flecks on a indigo background (see photo below). Coloration of the tomato pericarp (flesh) is a result of accumulation of various carotenoid pigments. The pathway for biosynthesis of these various carotenoid compounds is illustrated below. In the next few paragraphs the common mutations that lead to variations from the wild type phenotype are described, discussed and illustrated (our photos unless noted otherwise). 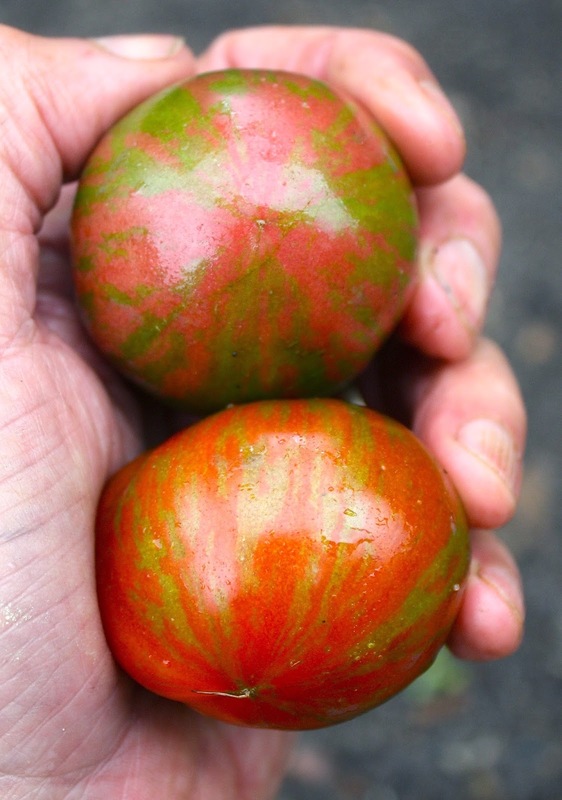 In the wild type, tomato pericarp pigmentation is red (R allele). The recessive r allele is the result of a loss of function mutation in the gene coding for the enzyme PSY1, which is involved in an early and critical step in the lycopene/carotenoid biosynthetic pathway. This mutation greatly reduces pigment synthesis generally during fruit maturation. 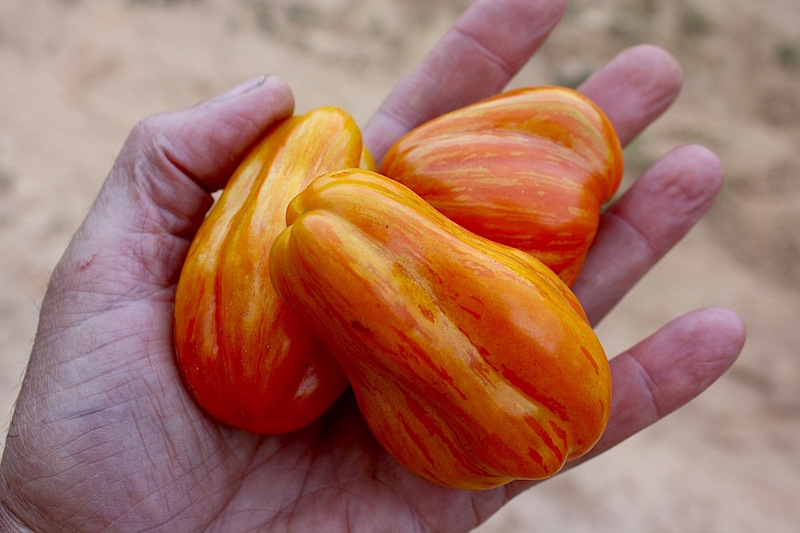 The yellow flesh phenotype of r/r plants is due to low levels of beta-carotene (77% reduction vs wild type) and an almost complete lack of lycopene. At this same locus, a third allele " ry ” is a modifier of r, and results in yellow fruit with various intensity and patterns of red streaks/blotches (e.g. bicolor). At an independent locus, downstream in the pathway, the tangerine gene “t” is responsible for the vast majority of tomatoes with orange flesh. 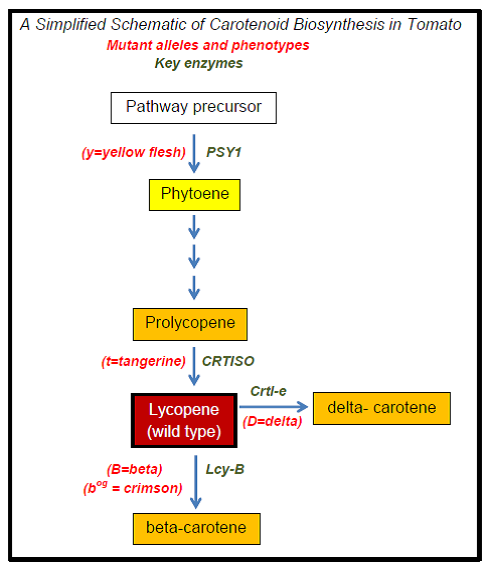 The recessive t allele is the result of a loss of function mutation in the gene coding for the enzyme CRTISO which causes an accumulation of prolycopene (orange pigment) rather than lycopene (red pigment). A plant homozygous for this mutation (t/t) will be dark orange in combination with R/- and lighter orange in combination with r/r. The double recessive r/r - t/t has a 90% reduction to total carotenoid pigments compared to t/t in a R/- background (reference and photo). 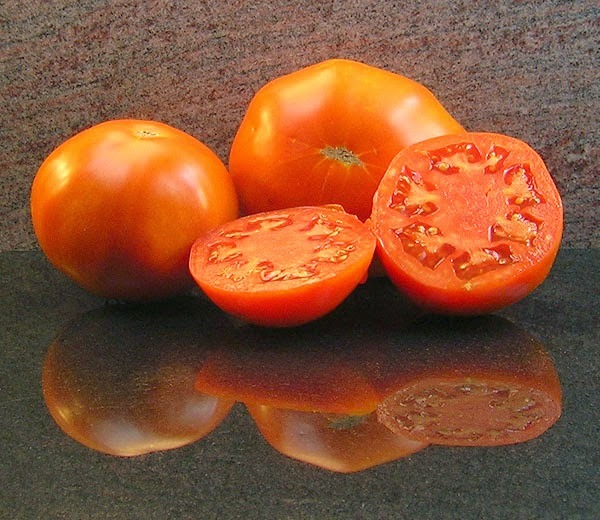 It has been recently shown that prolycopene, a cis isomer of lycopene, is 5x more efficiently utilized by humans than its red wild type trans-lycopene cousin (reference). 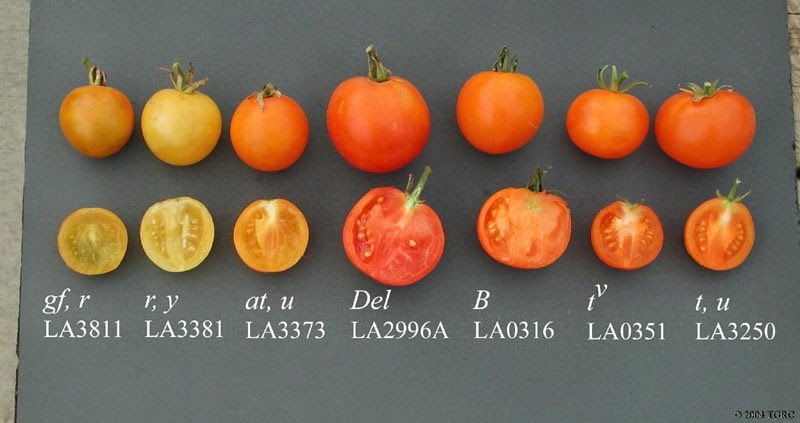 At another independent locus, the “Del” allele of the delta-carotene gene is a much less common determinate of orange flesh in cultivated tomatoes. 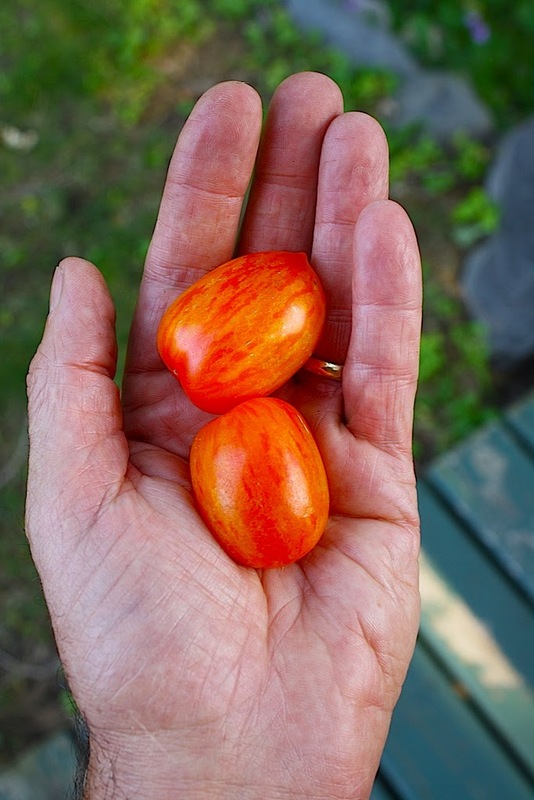 This gene was found in various wild relatives and has been introgressed into tomatoes. CYC-E is an enzyme that drives convertion of lycopene to delta-carotene. In the wild type the gene controlling this enzyme is only very weakly expressed during fruit maturation. The Del allele of this gene is expressed 30x higher than the wild type leading to an increase in delta-carotene concentration and a corresponding decrease in lycopene content. Del has functional incomplete dominance and Del/+ plants have red/orange flesh with <50% of total pigment being delta-carotene and Del/Del plants having orange/red flesh with >50% of the total pigment being delta-carotene. Like tangerine gene, the phenotypic expression of the Del phenotype is partially dependent on the genotype at the R locus. In wild type tomatoes the gene coding for the CYC-B enzyme, that converts lycopene to beta-carotene, is expressed at a low level in ripening fruit - lycopene content is normally >50x the content of beta-carotene. There are two important variants of the CYC-B gene, alleles which can significantly alter the red fleshed wild type phenotype. 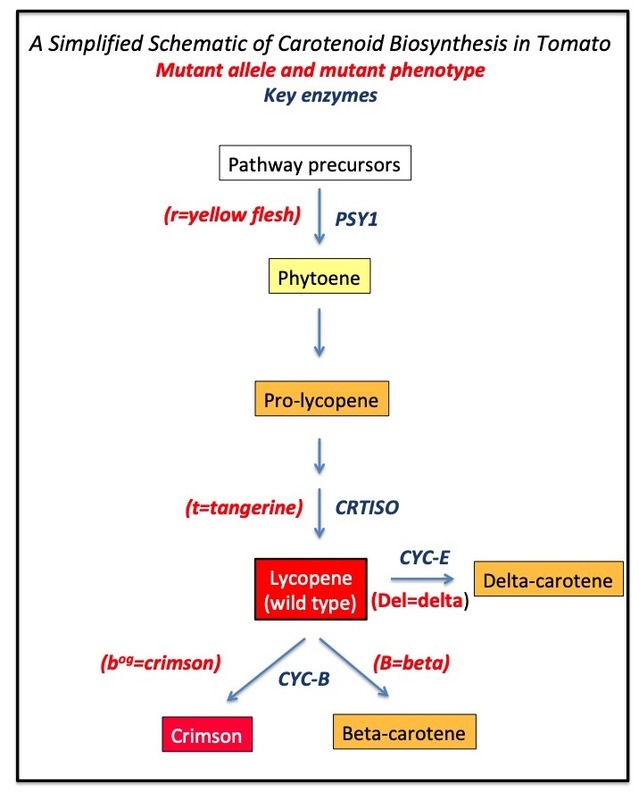 The “B” allele was introduced from tomato wild relatives and greatly increases expression of CYC-B, resulting in increased beta-carotene content at the expense of lycopene – resulting in orange fruit. "B" is inherited as a dominant allele. 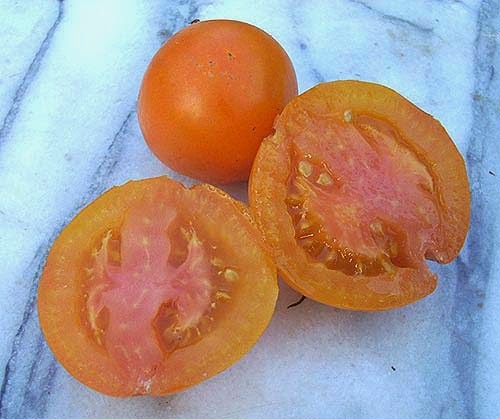 The second variant “ bog” (AKA old gold crimson) is a loss of function mutant for the gene coding for CYC-B and reduces the normally low levels of beta-carotene to near zero, with a corresponding increase in lycopene content. 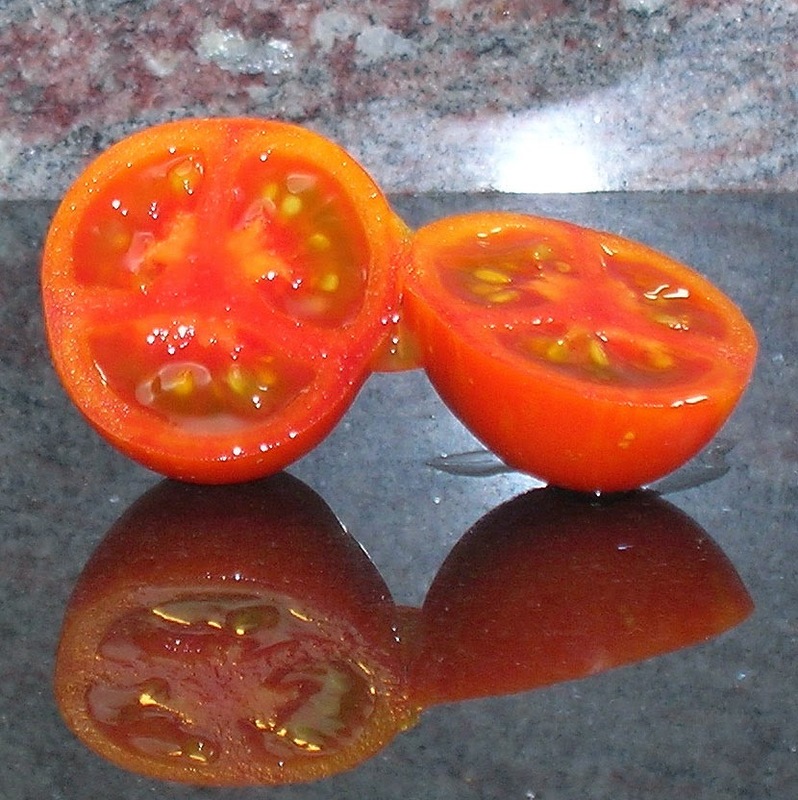 Crimson type tomatoes, with elevated lycopene content are bog/bog in a red fleshed background (see photo). 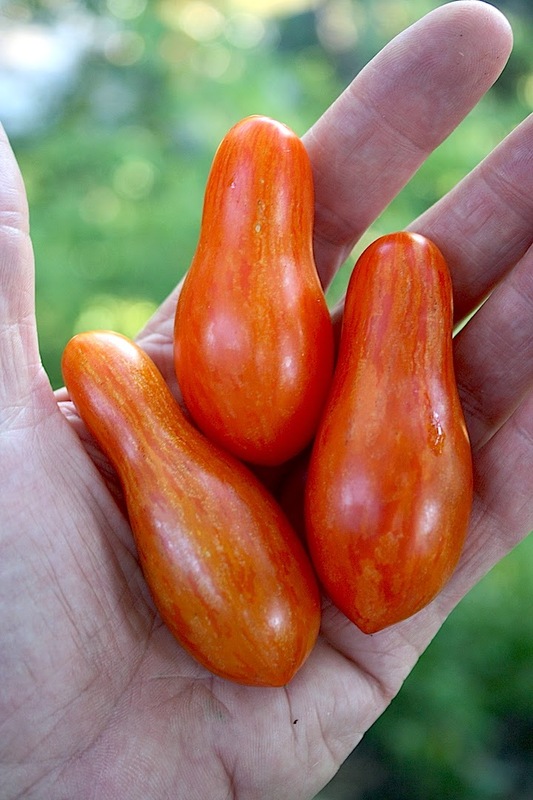 A novel tomato fruit color, apricot, was discovered in tomatoes purchased in a Mexican market. Flesh color is yellow/orange, often with a red blush near the fruit center. Both at/at and r/r plants have very low lycopene content. Fruit from at/at plants have beta-carotene levels similar to wild type, significantly higher levels than from yellow fleshed fruit of y/y plants. The biochemical mechanism for this trait is not well understood, but is thought to be related to a mutation in a transcription factor associated with fruit ripening. 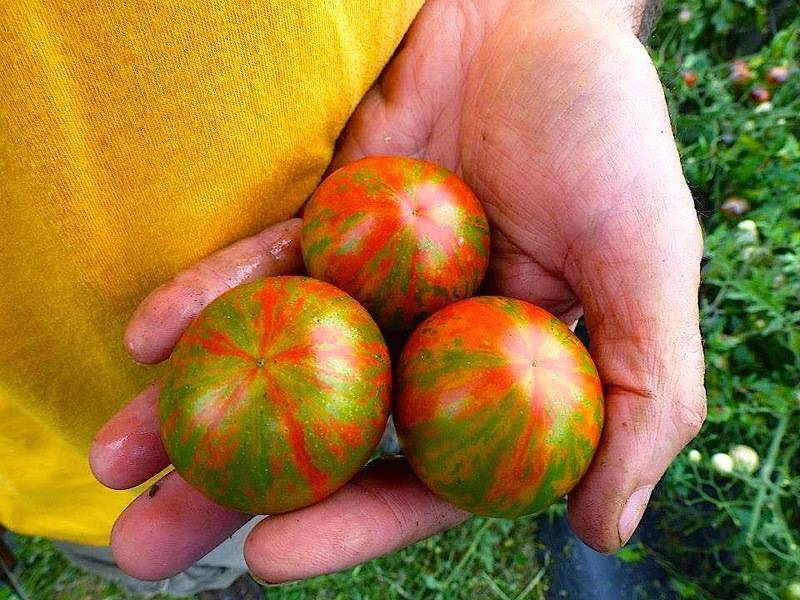 Although there are no commercial tomato varieties with this trait, Keith Mueller has been working with an at/at breeding line – and finding very interesting coloration (reference). Recently scientists have identified several QTL markers, associated with independent genes of unknown function, that enhance lycopene concentration in tomato fruit (reference). These are independent of, and perhaps additive to, bog/bog (i.e. crimson trait). The Green ripe trait is one of several that affect normal fruit maturation. The mutant Gr allele (allelic to Nr – never ripe) is a deletion in a wild type gene that has the effect of making the fruit less sensitive to the plant hormone ethylene. Ethylene governs many key steps in fruit maturation and plants containing the Gr allele (Gr/-) make fruit that never fully ripen. The color of ripe fruit is green with a yellowing blush, often with a red/pink center. The fruit remains very firm and does not significantly accumulate sugars, acids or other flavor compounds. The delayed ripening genes “rin” and “nor” when homozygous, give a similar fruit phenotype. Plants that are rin/+ or nor/+ have normal fruit coloration and delayed fruit senescence (see Fountain of Youth blog). 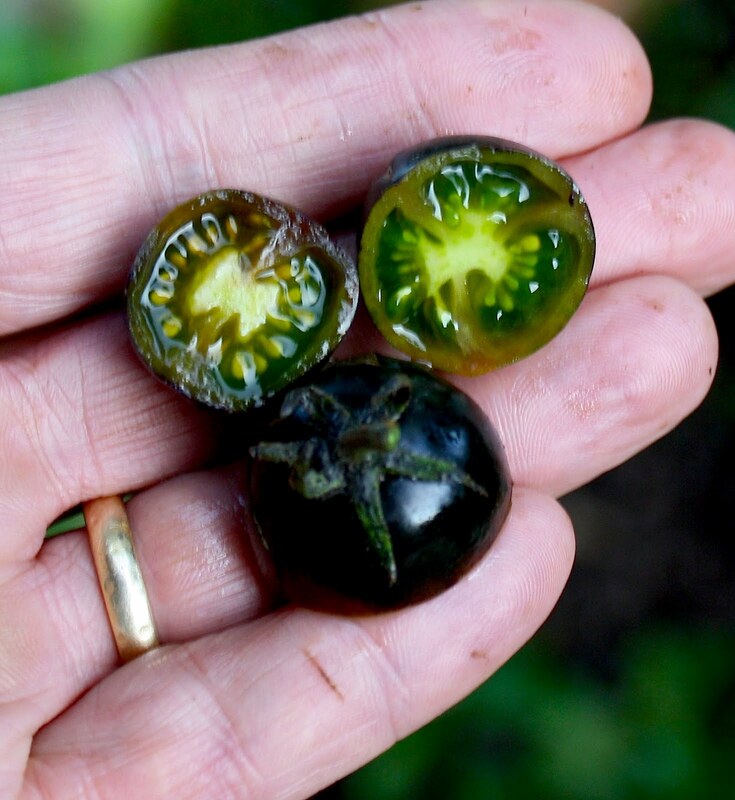 As fruit of wild type tomato plants mature, concentration of the green photosynthetic pigment chlorophyll decreases and carotenoid pigments increase – chloroplasts become chromoplasts, and the fruit begin to turn their predestined color: red, orange or yellow. 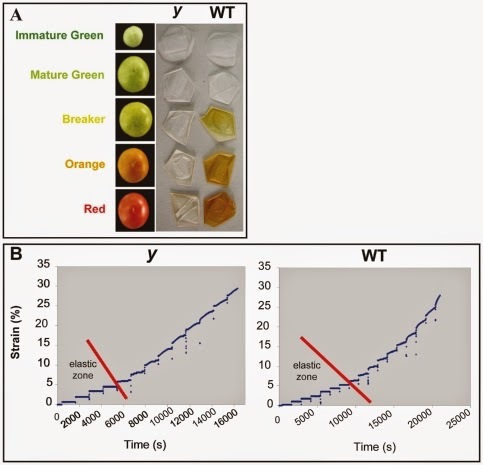 The green flesh allele “gf” is a loss of function mutant in SGR1, a gene responsible for producing a protein required for chlorophyll breakdown in maturing tomato fruit. It was recently reported that there are at least five independent loss of function mutations in this gene, giving rise to several alleles of gf, all with the same gf phenotype. 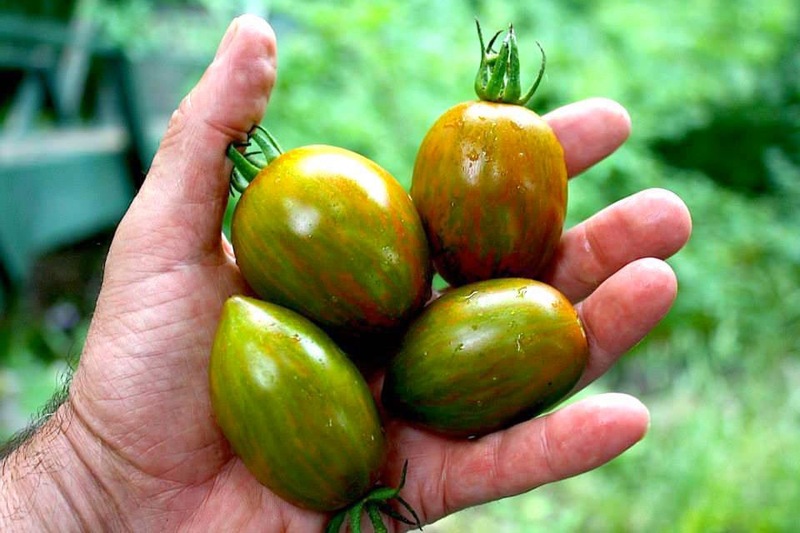 Tomato plants homozygous for this recessive mutation (gf/gf) retain chlorophyll in mature fruit, but also accumulate their normal carotenoid pigments as determined by the major genes described above. 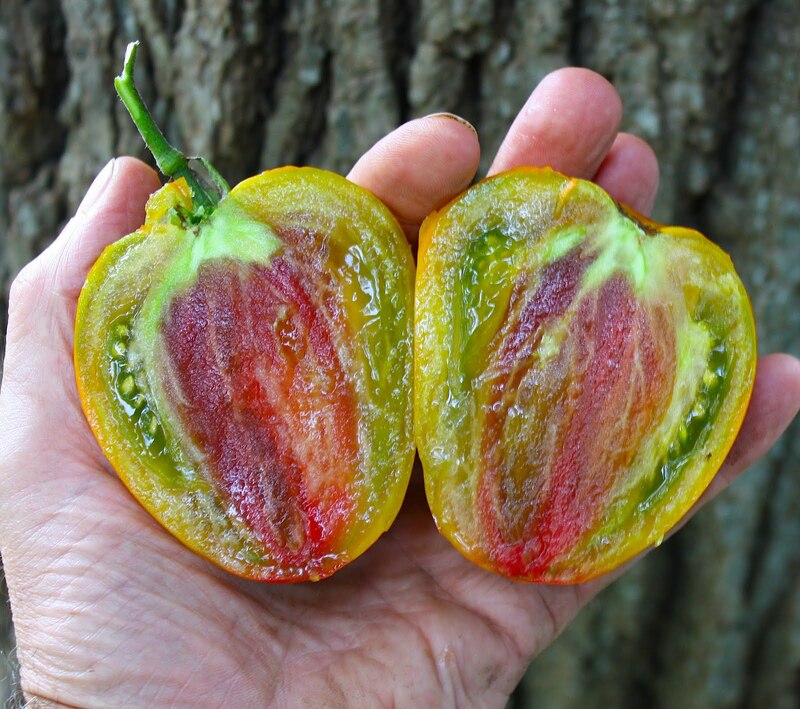 In the presence of retained chlorophyll, fruit predestined to have red flesh become muddy brown (AKA “black”), pink becomes purple, orange becomes orangish/green and yellow becomes green when ripe (GWR). 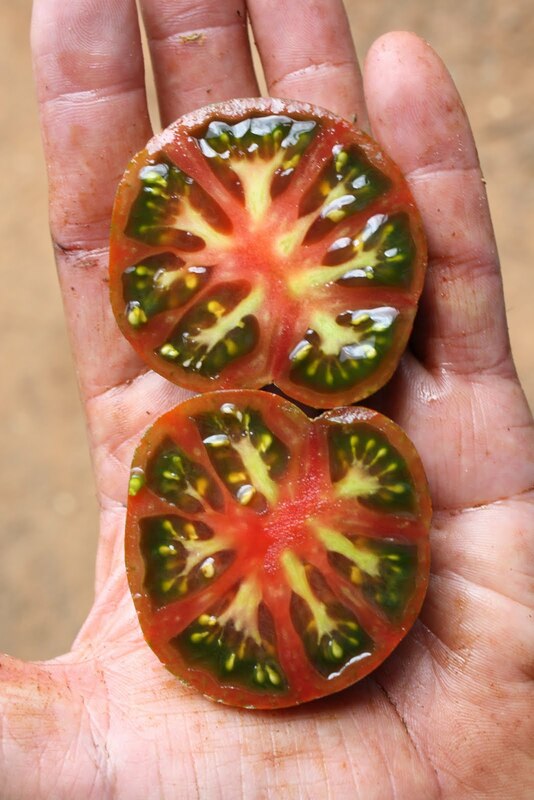 In tomatoes the term bicolor generally refers to fruit that has some combination of two (or three) flesh colors, in a vast array of potential patterns. 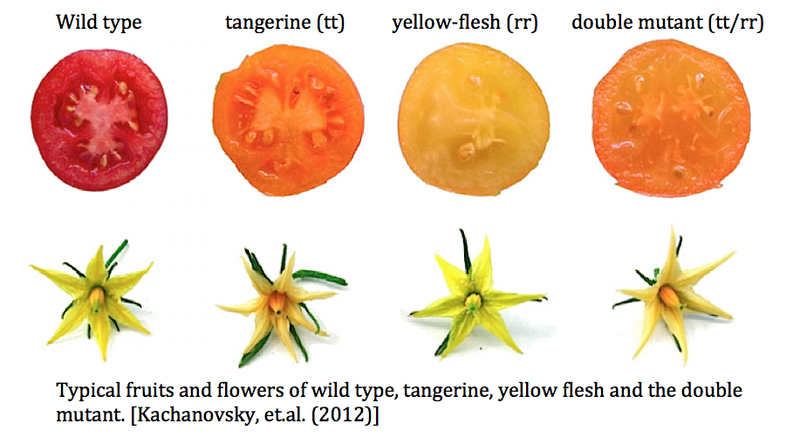 As discussed earlier, the ry allele at the R locus confers red steaks in yellow flesh (e.g. 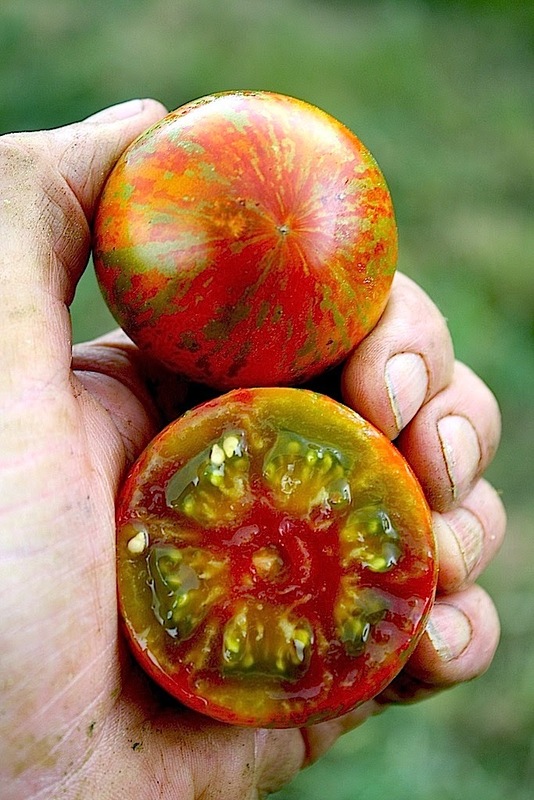 Big Rainbow and many others) with blotchy red pigmentation often evident even on the fruit surface. In a gf/gf background ry/ry probably leads to red streaks in green flesh, as in the variety Berkeley Tie Dye and others. However, there are much more complex combination of bi/tri-color flesh pigmentation (see photos) not easily explained by these or any other combinations of the genes discussed above. The degradation of carotenoid pigments leads to the formation of numerous aromatic/volatile compounds that affect tomato flavor. This is particularly true for the +/- red wild type, crimson, tangerine and delta-carotene type tomatoes, and much less so for the r/r, B/- and at/at low lycopene types (reference). 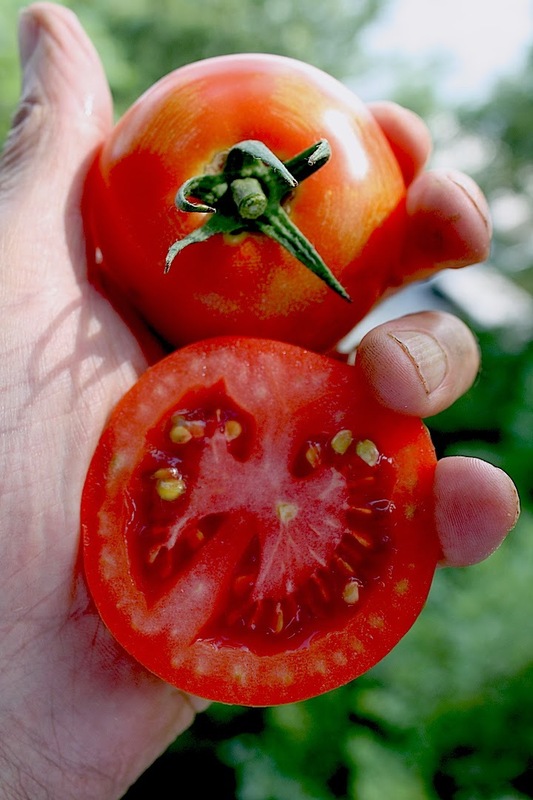 As we hopefully learn more about particular volatile compounds and their effect on flavor – a breeding strategy for manipulating pigment types/concentrations may one path for better tasting tomatoes. The carotenoid and flavonoid compounds found in tomato also have direct benefits in human nutrition. These compounds generally are very effective anti-oxidants, and have demonstrated significant anti-cancer activity. Beta-carotene is also a direct precursor for vitamin A. Our primary interest in better understanding the genetics and inheritance of fruit color in tomatoes is to better predict the phenotype of crosses between various types, and to best design selection strategies for achieving complex combinations of colors, stripes, etc. The fact that we continue to get unexpected results from crosses and find a few very novel phenotypes not described in the literature – suggests to us there are still a lot of unknown genetic factors at work, probably mostly modifier genes with an epistatic effect on one or more of the major genes described above.